Staff Centre Shipmanagement Ltd completed installation of ClassNK PrimeShip-GREEN/EEOI software on all managed ocean-going bulk carriers. PrimeShip-GREEN/EEOI is a system used for the calculation and analysis of EEOI (Energy Efficiency Operational Indicator) of a ship in order to check GHG (CO2) emission levels during ship operation based on IMO guidelines (MEPC.1/Circ.684). 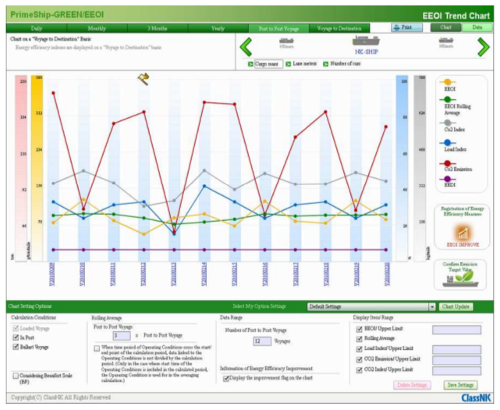 Users can visually confirm variations in energy efficiency and its contributing factor by displaying EEOI calculation results in a trend chart. PrimeShip-GREEN/EEOI is expected to help facilitate the improvement of the energy efficiency of ships. PrimeShip-GREEN/EEOI consists of two specialized applications: "EEOI-Onboard" for data input, and "EEOI-Web" for EEOI calculation and analysis.